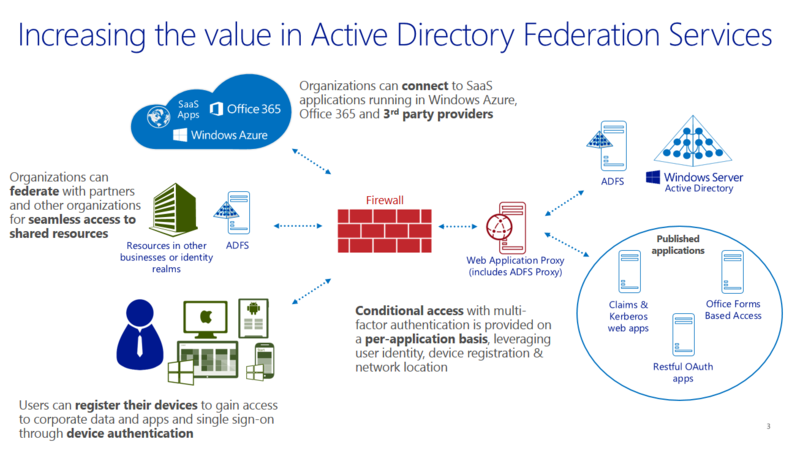 The Web Application Proxy is part of Remote Access role in Windows 2012 R2 and is all about publishing access to resources internally in the corporation. It’s web application publishing! It has a very specific BYOD flavor to it! Microsoft Forefront UAG is still in market! Microsoft will be releasing Service Pack 4 for Microsoft Forefront UAG 2010 later this year. The service pack will bring additional platform support to Microsoft Forefront UAG. Microsoft UAG will continue to move forward and be supported until sometime around november 2015. Again i would like to mention that the web application proxy is not ment to replace Microsoft Forefront UAG 2010 in the R2 release! Web application proxy is designed to enable new scenarios that was not possible to put into the current Microsoft Forefront UAG 2010 code base. I personally believe that Microsoft will either be discontinuing Microsoft Forefront UAG 2010 sometime during 2015 with the announcement of Windows server 2016, create a new hybrid products that contains part of Microsoft Forefront UAG/TMG or add the features to a later release of the Web Application Proxy. During a talk with one of Microsoft developers they mentioned that the Web Application Proxy could be used to publish Microsoft Sharepoint server and Microsoft Exchange server. I have not yet been able to very that fact.